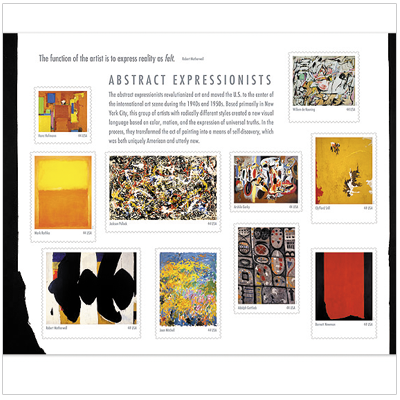 I was excited to find out that the United States Post Office was offering a series of stamps based on the work of Abstract Expressionists. Amazing to me, since it took a while for these artists to be accepted by the public, and now you can add them (Rothko, de Kooning, Pollock, and more) to a corner of your envelope! I wonder how you choose which Jackson Pollack to use... I mean, they all sort of look similar. :) Luckily, there's only one in the bunch! I don't think I'd mind using up the Pollock. I'd be hanging onto the Rothko (orange and yellow color fields), the Gorky (third row, third one to the right), and Newman (bottom right hand corner) for sure though.